Despite having the new Airbnb logo —the Belo compared to various body parts and objects, Airbnb does not hold offense. In fact, they made an infographic to thank people about it. Airbnb is being a real good sport even after a slew of logo parodies ranging from innocent to obscene iterations and not to mention a song in Youtube about their new logo namely the Belo. Despite of all the negative comments the company found a way to turn the whole thing the other way around and use it to their advantage. 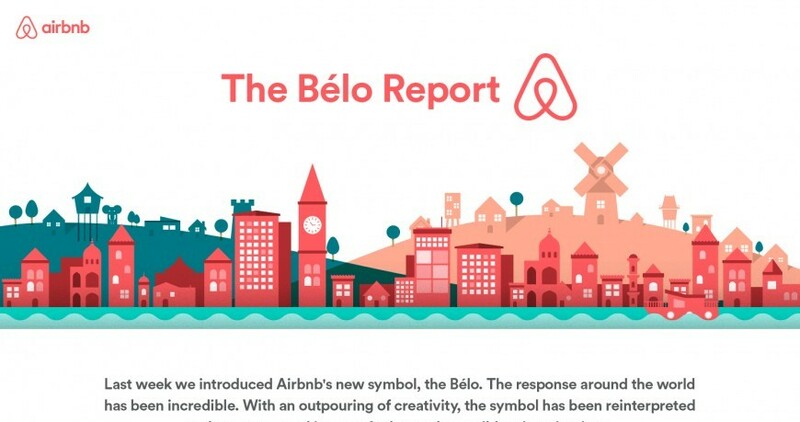 The company decided to create a simple infographic, that would also be use to remind people about Create Airbnb— which is a community driven website showcasing user profiles as well as customized versions of the Belo as well. The Belo Report infographic showcases the most common comparisons to the Belo and the number of parodies that was made. The infographic also features the figures of the total submitted stories and symbols in Create Airbnb as of July 23. What’s really nice about Airbnb’s move is that unlike other companies who would immediately slap out lawsuits to people that parodied their logos, Airbnb did not the company rather embraced it. The company welcomed the parodied Belos regardless if is hilariously innocent or extremely obscene. We wanted you to play with it, make it your own—which is why we made Create Airbnb—and you’ve certainly delivered. You’ve made us laugh, scratch our heads, gasp in amazement, blush, and sometimes do all at once. What do you guys think? Did Airbnb nailed it? Did they manage to turn things around and take advantage of the internet’s reaction to the Belo? Post your thoughts and comments below! Don’t forget to check us out in Facebook, Twiiter, Google+ and Pinterest for more things about design.